For years now gym goers have had a love hate relationship with the Smith machine. Some people absolutely love the Smith machine while other call it the biggest piece of s**** ever. Well like every two sides to a story, the truth falls somewhere in between. While “Nothing beats the basics!” When it comes to the Smith machine “Variety can be the spice of life!” Today we are going to look at a few exercises that you can do using the Smith machine that can really add some pep to your training. (1)The Smith machine was invented by Jack LaLanne in the 50’s. A guy named Rudy Smith saw LaLanne’s invention and helped made improvements on it. Smith placed the improved model in a gym he was managing and by the end of the 50’s the Smith machine was being widely distributed in gyms all over. 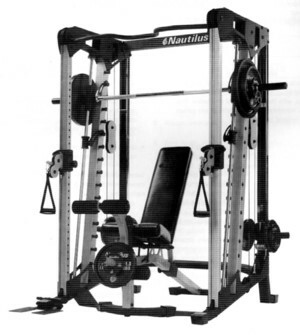 Conceptually the first Smith machines were very similar to the one in the picture. Flash forward to today and the Smith machine is almost as common in gyms as barbells and dumbbells now. In some gyms you may even find Smith machines but no squatting racks or shoulder press stations. The machine that started out as a leverage barbell machine can now be found with chin up bars, cable leverage attachments, and a bunch of add ons. The Smith machine is a versatile piece of equipment that a person can do a whole host of exercises on. One of the main benefits of the Smith machine is it allows a person to perform barbell movements with the stability of a machine. Because less stabilizer muscles are needed a person generally will be stronger on a Smith machine version of an exercise. Another huge benefit of the Smith machine is it is self spotting. This is great for someone training solo or for trying to push through a few extra reps. The biggest disadvantage of the Smith machine however is it does not hit the stabilizer muscles as well as a free weight barbell movement. This will not help a person improve their stability and overall balance. Some of the most popular exercises performed on the Smith machine are squats, bench presses, shoulder presses and lunges. Because the Smith machine travels in a fixed position using it for certain types of squatting and pressing movements may have a disadvantage because it does not travel in the same path as a free weight version of some of these exercises. While using the Smith machine has mechanical advantages and disadvantages for some of these exercises here are a few exercises that using the Smith machine will offer a big advantage with. Hatfield squats are typically done with a safety squat (or Hatfield) bar. The safety squat bar allows squatters to perform a back squat with less pressure on the shoulders and with less forward lean. The more upright a person stands the more the lower back, glutes and hamstrings are strengthened and the less pressure that is applied to a person’s knees. Most home and commercial gyms do not have safety squat bars. 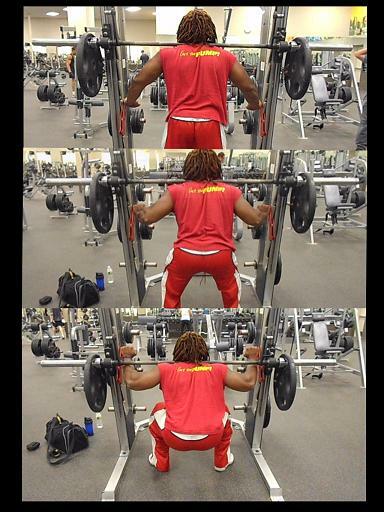 The Smith machine however can help by mimicking this type of squatting movement. If you have the type of plates that have holes in them, then you can mimic the effect even more by letting the pltes hang lower. Dumbbell rowing is arguably one of the best exercises a person can do for developing thick strong lats. The problem some people have when rowing heavy is they tend to use more “Body English” than actual muscle when the weights get heavy. Because Smith machine one arm rows travel in a fixed plane of movement, the lat muscles gets more isolation and constant tension. If you want raw power and overall shoulder development, a person should go with the standing overhead press. If you have shoulder concerns or don’t always have a spotter around, the Smith machine shoulder press makes a great alternative. While you wont develop the stabilizers from say an overhead press you can do some heavy shoulder pressing in a safe fixed plane of movement. Push ups are overlooked in a training program way too often. Fact is push ups are one of the best exercises to add to a training regiment. The one problem with push ups is once a person gets pretty good at them, they need to do quite a few to feel any effect. By using the smith machine for added resistance a person can really turn a push up into a super power movement. A person can do crunches till they are blue in the face but that is not really going to develop abdominal strength. Crunch after crunch will develop some good endurance but not a lot of strength. A strong core will help a person in all aspects of training and everyday life. Developing a strong core is all about building muscle strength and not muscle endurance. Turn a normal crunch into a power crunch with the help of a smith machine.